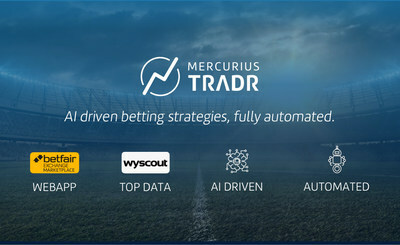 MILAN, March 27, 2019 /PRNewswire/ -- Mercurius is today announcing the launch of its new application, Tradr, in the Betfair App Directory, which makes successful sports trading as simple as pressing a button. Consistently positive returns are possible thanks to, Mercurius' proprietary Artificial Intelligence algorithms that powers fully automated value betting strategies. For 2 years Mercurius has been developing its proprietary trading algorithms and today it's able to provide a fully automated trading system, that enables professional traders and sophisticated investors to invest in sports betting according to their chosen risk profile. The app is a very simple interface connected to a very powerful and sophisticated AI engine; Betfair users just have to connect their Betfair account to Mercurius' App, choose their initial investment amount for their bankroll and then activate their chosen strategy; Mercurius Intelligence does the rest. Mercurius technology stands out from the usual value betting strategies because it's able to calculate its own fair odds instead of using sharps bookies and line movements as a reference. This is possible because more accurate probabilities are calculated through fundamental analysis, meaning their AI analyses how well players and teams are playing by crunching millions of data points (goals scored, shots location, player skills). This innovative approach has several benefits: strategies do not depend on market sentiment, but rather exploit it; clients don't need to have hundreds of soft books accounts nor they incur into restrictions. "It's a great time for data science and betting, as the Big Data revolution has completely redefined how successfully you can analyse sports betting opportunities. Deep quantitative analysis allows Mercurius to forecast millions of outcomes and probabilities in seconds in order to uncover value bets: our AI crunches millions of data points describing matches second by second and creating a numeric picture of events and teams strength with much greater precision than was ever previously possible." – Lorenzo Malanga, Data Scientist and CRO at Mercurius. Mercurius BI is a tech startup, operating in Italy and in the UK, aimed at transforming sports betting into a new financial investment category. Mercurius was founded in 2017 by Fabrizio Machella (CEO), Lorenzo Malanga (CRO) and Mario Ciardulli (CMO), and subsequently backed by an Italian VC and Wyscout in 2018. Since its inception, Mercurius has been improving its proprietary AI algorithms to crunch massive amounts of detailed sports data in order to create profitable value betting strategies. Today Mercurius's technology is available to professional traders and sophisticated investors through its app for the Betfair Exchange (https://trader.mercurius.io). Mercurius's innovative quantitative approach to sports betting trading is the foundation for the Company's vision of establishing sports betting trading as a viable alternative investment asset class. The Company is now eager to start working with investment firms to create tailored financial products based on sports betting trading that are targeted at qualified investors.